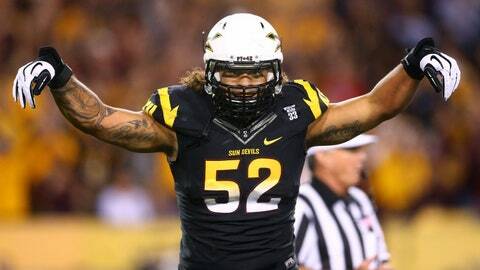 Carl Bradford led ASU with 19 tackles for loss and tied for the team lead with 8 1/2 sacks as a junior in 2013. 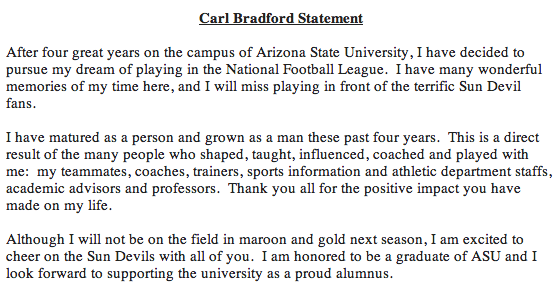 Arizona State linebacker Carl Bradford will forego his senior season to enter the NFL Draft. ASU announced Bradford’s decision after reports early Monday he had hired an agent. Bradford himself confirmed his intentions by issuing a statement Monday night through his new agency, Athletes First. "After four great years on the campus of Arizona State University, I have decided to pursue my dream of playing in the National Football League," Bradford said in a statement released through his new representatives (see full statement below). "I have many wonderful memories of my time here, and I will miss playing in front of the terrific Sun Devil fans." "It was an honor and a privilege to coach Carl Bradford at Arizona State University," Graham said. "Carl leaves ASU with his degree, and that is what we are most proud of. Additionally, with players like Carl, Will Sutton, Chris Young, Osahon Irabor and Alden Darby we built the No. 1 defense in Pac-12 Conference play and one of the top-rated units nationally. 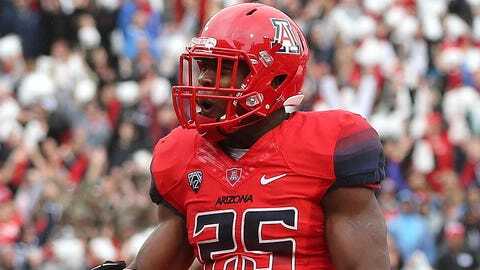 "We want to be known for tough, stout defense at ASU, and Carl helped us achieve that in 2012 and 2013. We appreciate Carl for being a great Sun Devil and wish him nothing but the best in his future endeavors." While Bradford’s official draft grade remains unknown, a source told FOXSportsArizona.com last week that one NFL scout who was part of the group that evaluated Bradford had given him a third-round grade. Bradford, a fullback in high school, tied for the team lead in sacks this season with 8.5. He also registered 61 tackles, including a team-best 19 for loss, and earned second-team All-Pac-12 honors amid a steller group of conference linebackers. Listed at 6-foot-1 and 243 pounds, Bradford was perhaps ASU’s best athlete. Prior to last season, video of Bradford power-cleaning 400 pounds during ASU’s summer conditioning program briefly went viral. His athleticism could boost his draft stock at the NFL Draft Combine in February. With the loss of Bradford, ASU will have to replace nine starters on its defense, which last season ranked fourth in the Pac-12 in total defense, first in turnovers (seventh nationally), third in sacks and second in tackles for loss.